A recent year-long study by England Athletic has claimed that running is invaluable in the fight against depression and anxiety - around 20% of men suffer the conditions at some point in their life. Of the 13,000 new runners surveyed by England Athletic, 74% said they had experienced improved mental health and wellbeing, and 90% said their happiness had increased after being part of a group - citing new friendships and motivation as key factors. When you run beyond your comfort level, specialised muscle cells secrete two mood enhancers: endorphins (a neurotransmitter) and Anandamide (similar to THC, the active ingredient in marijuana). It's your body's way of rewarding you for keeping active. Now the two chemicals reach your brain cells. Anandamide crosses easily, but endorphins struggle. 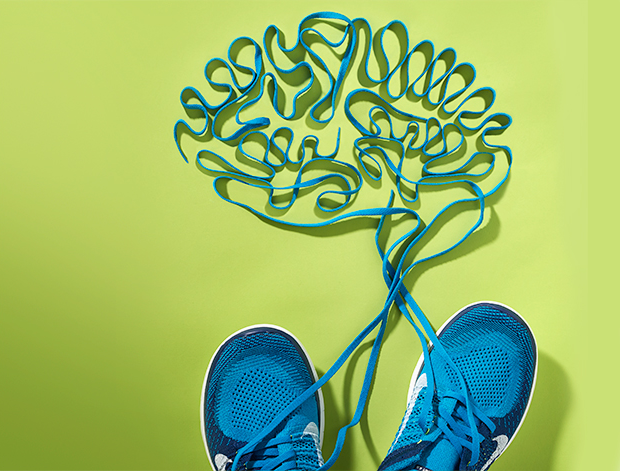 Luckily your brain produces its own endorphins so your mind feels good. Over time you'll have to run further to get the same high, an incentive to go further and get fitter. The two potent mood enhancers are now flooding your body. Their combined work limits pain sensors called nociceptors that spread out from your spinal cord. Result: you feel the burn later by pushing back the pain barrier while increasing your body's staying power. The endorphins start to downshift your brain's pre-frontal and limbic regions, so you begin to feel a sense of happiness as you run. As more endorphins reach these areas, you start feeling the glowstick-grade euphoria that already has you planning your next 10K. As you finish up, the neurotransmitter dopamine, which contributes to lust and addiction, binds to receptors in your brain’s pleasure circuit, where it sends blissed-out vibes throughout your brain for hours after you stop. But this is one high that comes with zero comedown.